On stage, yes nurtures the fantastic and bizarre, the silly and playful and ridiculous. Off stage, yes steps into the beauty, messiness, playfulness, and adventure of life. Yes embraces wonder, responding to the invitation into the fullness of life. Yes can transform an experience, turning the mundane into magical. Yes can turn acquaintance into friend. Yes can unlock someone from a stereotype into story. I am talking about the yes that leans into adventure and possibility, into new endeavors and a willingness to discover, the yes that knows that life is constant growing and learning. I am talking about the yes of being internally rooted, without of fear trying something unfamiliar or awkward. I am talking about the yes that has space for someone else’s contribution and ownership, a yes that invites creativity and does not fear failure. It is a beautiful and important thing that we learn how to say authentic yeses to each other. Even if we need to adjust them later down the road in clarity or details, that initial yes is important. Know this: that initial yes is not actually to the idea, it is to the person offering their voice. In Writing Down the Bones, Natalie Goldberg nurtures budding writers, “Our task is to say a yes to the real things of our life as they exist—the real truth of who we are...to become [those] who accept things as they are, come to love the details, and step forward with a yes on our lips so there can be no more noes...that invalidate life and stop these details from continuing." The yes learned on the stage of improv is a yes that invites life instead of invalidating it, making space for details and dreams, stories, and surprise. It may be the yes of the disciples who respond to a stirring within themselves by discarding their fishing supplies and taking to the dusty road in step with their Teacher. It may be the yes of the Israelites venturing away from the predictability of slavery into the uncertainty of the wilderness. It may be the yes of letting dust and spit be tossed into our eyes, trusting that sight is on the other side of this fog. After my divorce, I wanted to say a lot of noes: fear and pain wanted to hide, shrink, and retreat. Then, some coworkers made me laugh, and I made them laugh. A few months later, registering for level 1 improv classes became my personal invitation to myself to begin practicing the yeses that welcome in new life, healing, creativity, and joy. 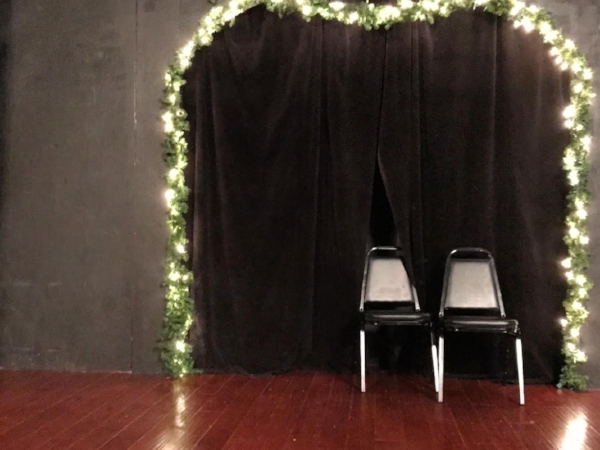 The improv community has been one of the places that has been bringing me back to life ever since. Practicing yes equips us to venture out into life with a tenacity and innovation that heals despair, repairs hope, and invites the soul to imagine. We say yes to courage and possibility. Practicing yes encourages us to welcome one another and build together as we go. We are practicing yes upon that stage so that we might invite each other into spaces of invention and invitation, and so that we might say yes more wholeheartedly to the road ahead of us and the abundance within us.